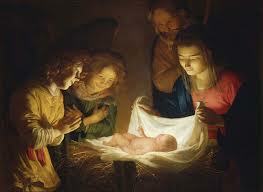 CS Lewis calls the Incarnation "The Grand Miracle." In chapter 2 of Hebrews, we continue the thought that Jesus Christ is better than the angels...not just because He's the Son of GOD, but because He's the Son of MAN. What an incredibly important truth for fallen man! Go through Hebrews 2:9-18 and see if you can give 5 descriptions of Jesus as our God-Man. They are listed for you below,* but why not try them on your own first. Spend time reflecting on how your Great High Priest has come to your aid in the past and how you need Him to come to your aid today. Praise and pray! A couple years ago, I took my grandsons, Evan (5 y.o.) & Carter (4 y.o. ), to visit my mother-in-law ("G-G" to them) who lives in a local senior center. I told the boys how happy old people are to see little guys. I described to them how these old, sad, depressed faces would change to happy and smiling faces when they saw them. "Those old folks will 'come alive' because you boys are so special! You just watch!" I said. Sure enough! Resident after resident began talking, smiling, stopping the boys to interact with them. In fact one man was so overcome that he had to try to hold himself back from trying to hug them and squeeze them. So after we made it through the "gauntlet" of popularity, we visited with G-G, taking her to the ice cream parlor as usual. Me: "Didn't I tell you? You boys are very special!" Carter: "That boy (pointing to Evan) isn't special! " Me, somewhat taken aback but figuring it was the usual sibling stuff: "Oh, but he is special!" Carter: "But he's mean to me!" Me: "That doesn't mean he isn't special...that just means he's not acting like the special boy that he really is!" As I drove on that day, I reflected how this is a perfect illustration of our lives as believers. one with the Triune God through the indwelling Holy Spirit. But rather than letting the living, indwelling Lord Jesus Christ live though us as us, we, more often than we like to admit, chose to live from the deadness of our flesh. Brothers and sisters, let's live from the fullness of Him who made us special. Amen! Play and read through the lyrics of your favorite Christmas carol or enjoy the one below. Take 2 colored pencils and mark in one color, references to Jesus as God and in another color, references to Jesus as Man. If you are really ambitious, do the Bible study associated with each line.